A group of Dutch college kids are on an unusual road trip around the United States. Earlier this month in Los Angeles, they won a drag race with a helicopter. They’ve since crossed the country, but have never had to stop at a gas station. The students, from Eindhoven University of Technology, are demonstrating an electric motorcycle they built with an impressive 230 miles of range. When a battery dies, they swap it for a fully charged one. Their trip is a reminder of the foothold that electric motorcycles are starting to find. Electric cars have drawn national attention with the popularity of Tesla (TSLA) and new options from leading automakers, including GM’s (GM) Chevy Bolt. Goldman Sachs projects that one in four cars sold in 2025 will have electric engines. As batteries continue to get more powerful, electric motorcycles are expected to be more appealing. Currently, most electric motorcycles and scooters are sold in China, where low-cost, low-powered models are most popular. But sales are taking off elsewhere. Electric motorcycle sales in Europe in 2015 nearly doubled from the year before, according to Navigant Research analyst Ryan Citron. The Dutch students have yet to decide if they will be commercializing their electric motorcycle. In the United States, electric motorcycles — which range from about $9,000 to $20,000 — are still a rarity. 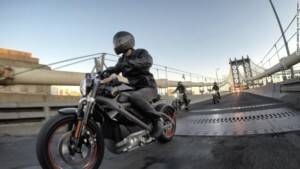 Navigant is only projecting 2,000 electric motorcycles to be sold in 2016. “What’s that inflection point? For us, we see 2020 as turning the corner to the next-generation battery technology,” Citron told CNNMoney. Harley-Davidson revealed a prototype of an electric motorcycle in 2014, but hasn’t begun sales yet. Citron expects the motorcycle will be key to spurring interest in electric motorcycles, given the company’s strong brand. Harley-Davidso (HOG)hasn’t revealed when it will start selling the motorcycle, or its price. A Harley-Davidson spokeswoman said timelines that have been floated in the media — 2017 or 2020 — aren’t accurate. By waiting to launch the motorcycle, Harley-Davidson benefits from advances in battery technology, which will make the bike more affordable and powerful. Rather than the traditional roar of a gas engine, the motorcycle sounds like a blend of a jet engine and a screeching animal. The Harley-Davidson spokeswoman did not comment on whether the company is amplifying the motor’s sound to make it more appealing to customers. While it certainly sounds like it belongs on an airport runway, no word yet on if it will be challenging helicopters or planes to races.